Compare Home Carpet Cleaners and Washers: Hoover Power Scrub FH50150 or Bissell ProHeat Revolution 1548? It should be usable on various surfaces such as carpet, low pile carpet, rug, stairs and upholstery. It should come with a hose and various attachments that make it easy to clean stairs, upholstery, and hard-to-reach areas. Note that unlike a vacuum cleaner's hose which is dedicated to a single direction air flow, the hose on a carpet cleaner also feeds the cleaning solution to the attachments (or tools) that are the end of the hose. It should be equipped with two tanks, one for the clean water and the other for the collection of the dirty water. It may or may not have a separate cleaning solution compartment. When there isn't one, the cleaning solution is added to the clean water tank. Note that it is recommended to fill the clean water tank with hot tap water at around 140°F (but never at boiling temperature!). The use of hot water as opposed to cold, significantly improves cleaning performance. Thanks to these modern home carpet cleaners, you don't have to rent a deep cleaner from a store to refresh your carpets any more. When regularly used, these machines extend the life of your carpets, rugs and upholstered furniture. This article will compare Hoover Power Scrub FH50150 and Bissell ProHeat Revolution 1548 upright home carpet cleaners. Hoover Power Scrub was the most popular home carpet cleaner among Amazon customers at the time this article was written, and though Bissell ProHeat is a more recent product, it became very popular in very short time receiving excellent reviews from most Amazon buyers. Selected Carpet Cleaners on Amazon. The height is measured from the floor to the top of the handle. Hoover Power Scrub Deluxe Carpet Washer FH50150 is equipped with Hoover’s exclusive SpinScrub technology which uses a multiple brush system with brushes that spin in 360 degree manner to remove thoroughly from the carpet and upholstery deeply embedded dirt and tough stains. The counter rotating brushes spin, not roll, for constant carpet contact. Note that the brushes are removable for easy cleaning. ​Bissell ProHeat Revolution 1548 is equipped with Bissell’s DirtLifter brushing technology which uses 12 rows of brushes spread over dual rotating rollers. Note that these brushes are not removable for cleaning after each use and need to be cleaned using the method recommended in the user manual. Hoover Power Scrub allows both brushes and nozzle to be removed easily for cleaning. With Bissell ProHeat, only the nozzle can be removed easily for cleaning. To clean the brushes, the method recommended in the user manual should be followed. Note however that, if brush replacement is required, using the required tools as described in the user manual, one can remove the Bissell brushes. Both carpet cleaners are equipped with a two-tank system, one for the clean water and the other for the recovered dirty water. Note that the Hoover Power Scrub clean water tank is divided into two compartments: one for the clean water only and the other for the cleaning solution. The Bissell ProHeat clean water tank is not divided in two. Both the clean water and the solution are added to the same tank. 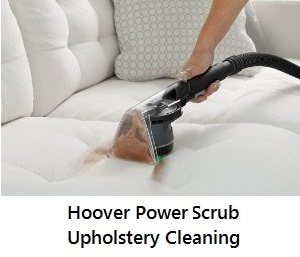 Hoover Power Scrub is equipped with a Wash and a Rinse cycle selector. This allows you to wash your carpets with water and cleaning solution and then rinse your carpets with water only, to remove all soap residues. Bissell ProHeat does not have a rinse mode. But it provides you with two levels of cleaning, a Deep Clean Mode for cleaning your toughest stains and an Express Clean Mode for quick clean-ups. It is recommended to fill the clean water tanks of both with hot (140°F/60°C MAX) tap water. 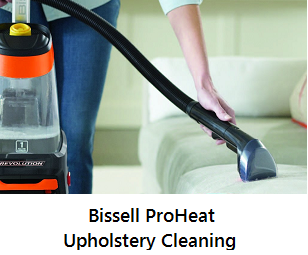 Note that Bissell ProHeat uses the Bissell exclusive Heatwave Technology feature that provides a constant source of heat to help maintain the temperature of the water you put in the machine, throughout the carpet cleaning process. Hoover Power Scrub uses forced heated air to dry the heated carpets rapidly. With Bissell ProHeat, you will need to let the carpets dry by themselves. But when using the Express Clean Mode, your carpet dries faster (in just about an hour). With Hoover Power Scrub, the clean water reservoir is divided into two compartments: one for clean water only and another for the cleaning solution. The solution is filled into the cleaning solution compartment to the fill line. The unit is equipped with an automatic solution mixing system that provides the correct amount of solution to the clean water for optimal cleaning results. Bissell ProHeat does not have a separate solution compartment. Both the solution and water are added to the clean water tank. When adding your choice of Bissell formula to the clean water tank, you should only fill your clean water tank with the user manual recommended amount of water and formula to achieve optimal cleaning. Hoover: Hoover 2X CleanPlus Carpet Cleaner & Deodorizer 32 oz (AH30335) or Hoover 2X PetPlus Pet Stain & Odor Remover 32 oz (AH30325). The above listed formulas (solutions) are all available below in the Amazon products section. Hoover Power Scrub: Powered SpinScrub hand tool, upholstery tool, crevice tool, stair tool, hose, tools storage bag and a small sample bottle of Hoover 2X CleanPlus Carpet Cleaner & Deodorizer solution. Bissell Pro Heat: Tough stain attachment, pet stain attachment, hose, storage bag, nozzle cleaning tool, a bottle of Deep Clean + Antibacterial Formula, and a bottle of 2X Professional Formula. So which of the two carpet cleaners is best for your home? Hoover Power Scrub is equipped with a separate cleaning solution compartment and an automatic cleaning solution mixing system that provides the correct amount of cleaning solution to the clean water for optimal cleaning results. With Bissell ProHeat, you need to add yourself the required amount of solution to the clean water tank. Hoover Power Scrub uses forced heated air to dry the heated carpets rapidly. With Bissell ProHeat, you will need to wait and let the carpets dry by themselves. 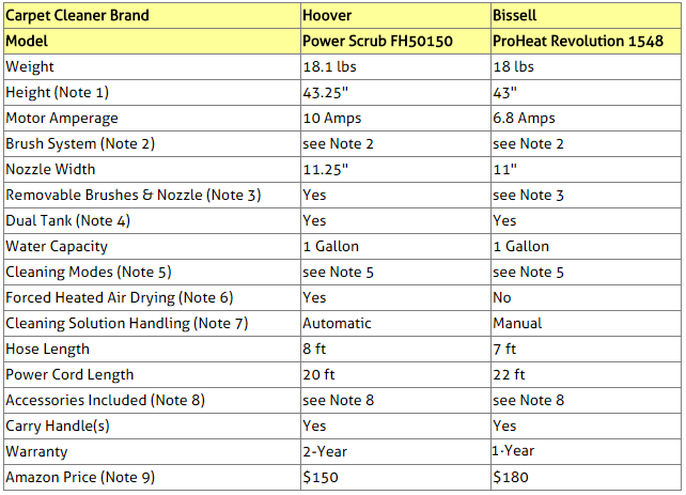 ​Hoover Power Scrub has an explicit rinse mode which Bissell ProHeat does not have. Hoover Power Scrub operates on 10 Amps of power and therefore is more powerful than Bissell ProHeat which operates on 6.8 Amps. Bissell ProHeat uses its exclusive Heatwave Technology feature that provides a constant source of heat to help maintain the temperature of the water you put in the machine, throughout the carpet cleaning process. Bissell ProHeat comes with a longer warranty of 3-Year as opposed to 2-Year for Hoover Power Scrub. Bissell ProHeat provides two bottles of cleaning solution with your purchase, while Hoover provides only a small sample bottle. Given the above information, we prefer the Hoover Power Scrub which we think gives you more bang for your buck! Note also that it was the top seller in the carpet cleaner category at the time this article was written. But as mentioned, though Bissell ProHeat comes with fewer features, it is also an excellent quality product as shown by the numerous raving Amazon customer reviews it received, and therefore, if the additional features Hoover Power Scrub comes with are not critical for you, there is a good chance that you'll be quite satisfied with the performance you'll get out of Bissell ProHeat. Please click the carpet cleaner of your choice below for price information or to purchase. You will also find below the recommended cleaning solution(s) for each machine. It is equipped with rotating dirt-lifter power brushes that loosen and remove even deep-down dirt from carpet. ​Cleans on both the forward and backward passes which reduces cleaning time. Dries faster than competitive rental cleaners. Equipped with large capacity both clean and dirty water tanks that enable deep clean with fewer trips to the sink, requiring less cleaning time. ​Has an ergonomically designed tank handle. You can easily select the height best suited to you. Allows easy cleaning hard-to-reach areas and upholstery with the 9-foot hose and 6-inch stair tool.